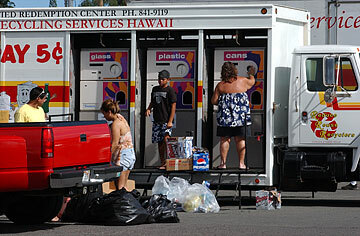 People input cans into a mobile redemption truck in a Kailua parking lot. The success of the state's HI-5 recycling program may soon end up costing consumers another half-cent per beverage container. Container redemptions appear to be on track to average at least 70 percent for the fiscal year that ends June 30, state statistics released yesterday show. If that happens, the nonrefundable fee would be increased to 1.5 cents, up from the 1 cent fee that has been in place since the program began in late 2004, said Larry Lau, Health Department deputy director for the environment. The extra money would help pay for processing and shipping the recycled containers. Consumers would continue to get a nickel back for each redeemed container. For the month of March, redemption rates dipped to 61 percent, down from 73 percent in February, according to Health Department statistics. However, a yearlong average from April 1, 2005, to March 31 showed an average of 69 percent of containers sold are redeemed. Because of unredeemed containers, the redemption program currently has about $19.3 million of uncommitted funds in its HI-5 account, Lau said. But if redemption stays above 70 percent, that extra money will dwindle, he said. Health Department spokeswoman Janice Okubo said that while the state collects 6 cents per recyclable container, the program actually costs about 7 to 8 cents per container. This includes the nickel refund to the consumer, plus the costs to pay redemption centers to collect the empties and refund consumers, and to pay companies that ship the glass, plastic and aluminum to mainland and Asian recyclers. "We're spending faster than we're taking in money," Lau said. Raising the fee a half-cent "was anticipated," said state Rep. Mina Morita (D, Kauai), a sponsor of the bottle bill. "We knew when we initiated the program that the penny would not suffice. If you really look at the cost, it should have been 2 cents." The actual costs have been subsidized by unclaimed deposits, she said. The earliest the increase in the nonrefundable fee could occur would be August. Okubo said it would be up to retailers how to levy the half-cent increase on sales of individual beverage containers. Since the recycling program's inception, the state has collected $76.7 million and spent $48 million, Lau said. Of the $28.7 million remaining, $9.4 million is already earmarked, including $3 million awarded in April to seven companies for adding new redemption centers or improving existing ones, he said. Reynolds Recycling opened its newest HI-5 beverage container redemption site in Waikiki last month. It's across Kalakaua Avenue from the Hawaii Convention Center, in a lot behind the Hard Rock Cafe, and is accessed from Kalakaua. The site is open Tuesday to Saturday, 9 a.m.-5 p.m., and accepts scrap metal as well as HI-5 labeled bottles and cans.